NEW YORK, NY--(Marketwired - October 10, 2013) - One-size travel does not fit all. That's why Premier Traveler dedicated an entire issue to one particular travel demographic that's growing faster than ever before - women - and discovered that, even within this group, the wants and needs of women who travel are as varied the destinations to which they roam. In "Risky Business," Janet Forman gives readers a peek inside the lives of four groundbreaking women who leaped into the travel industry's fast lane by taking a risk: Sara Kearney, now Senior Vice President of Brands at Hyatt Hotels Corporation, had to leave the only job she'd ever known. Liz Biden built the first boutique hotel in her current collection before she'd had any experience in the hospitality field. Aubrey Tiedt, Vice President of Guest Services at Etihad Airways, left her dream job as a flight attendant to fly a desk. And photojournalist Alison Wright quite simply risks her life to create the powerful images that illuminate the pages of prestige publications like National Geographic and the New York Times. 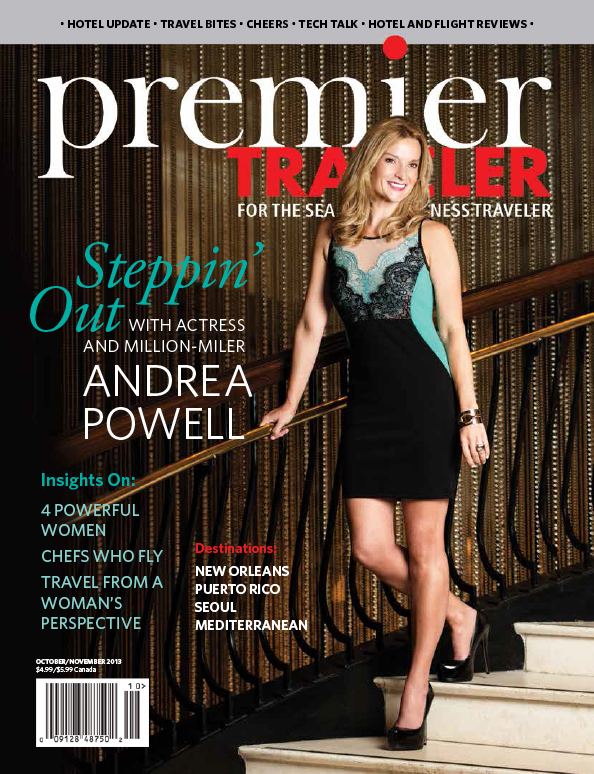 Gracing the issue's cover is peripatetic actress Andrea Powell, whose exclusive interview with Shân Willis - "Andrea Powell and the Possibilities in the Air" - uncovers this creative brainiac's life, movie career, web-design business and unquenchable thirst for travel. 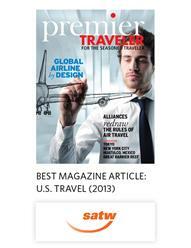 Following in its own footsteps, PT surveyed its readership once again - this time, to discover the differences in the ways that men and women travel. In "Women Travelers Speak Up," Janet Forman ties it all together and offers suggestions to help the travel industry keep female customers flying high. It's not quite all girl talk, though: In "Chefs on a Plane," Kathleen Squires escorts readers on a tour of the culinary excellence being pursued by some airlines. 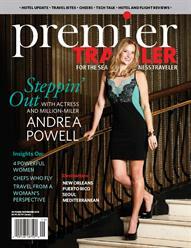 Plus, reader favorites - Travel Bites, Airline and Hotel Updates, Insider Reviews, Tech Talk, Loyalty Programs, News Flash - cover everything from chocolate indulgence to the latest travel developments, while Destination reports lead readers around the globe for a look at some of the world's most exciting hot spots. "We were really excited to be focusing on the ways in which travel is different for women," said Editor-in-Chief Ally Miola. "True to form, our readership responded to our request for their insight in full force, sharing anecdotes that - while they might be surprising to a few men - would no doubt elicit nods of recognition in most women." 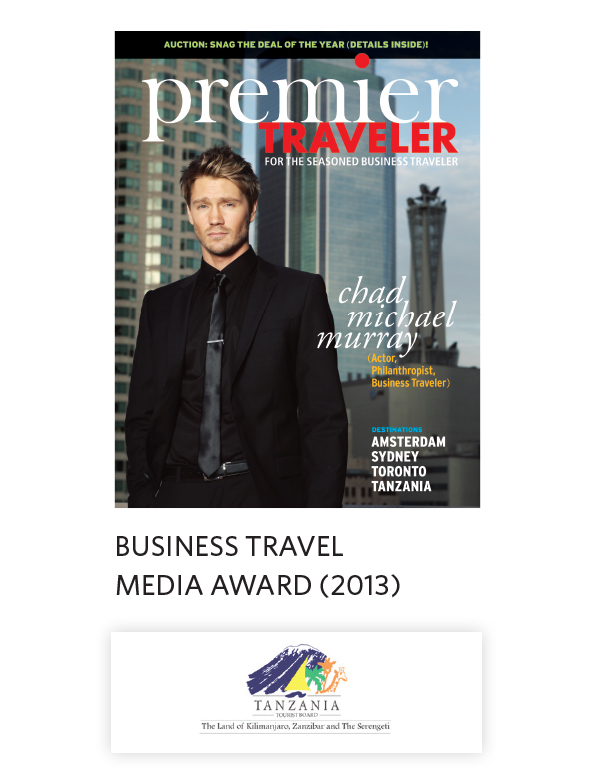 Miola was recently responsible for garnering another award for the magazine, when the Tanzania Tourist Board named PT the recipient of the prestigious Business Travel Media Award for 2013 for Miola's article "A Trek Through Tanzania," published in the February/March issue. "Frankly, I was a bit surprised by the overwhelming response from women for this issue," said PT Director Adam Rodriguez. "However, it was a lesson in quality over quantity: While the data may report that the number of female travelers is increasing rapidly, those statistics do not reveal the perspectives of those women. And discovering that particular landscape can be an eye-opening experience, especially for men. Our female readers are extremely savvy; we're even more convinced of that after the involvement with this issue. 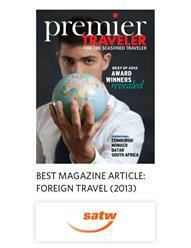 To give voice to that very personal viewpoint is part of what we at PT are proud to be able to do. We hope that this issue will not only influence travel-industry insiders to pay closer attention, but that it will inspire our male readers to do the same."